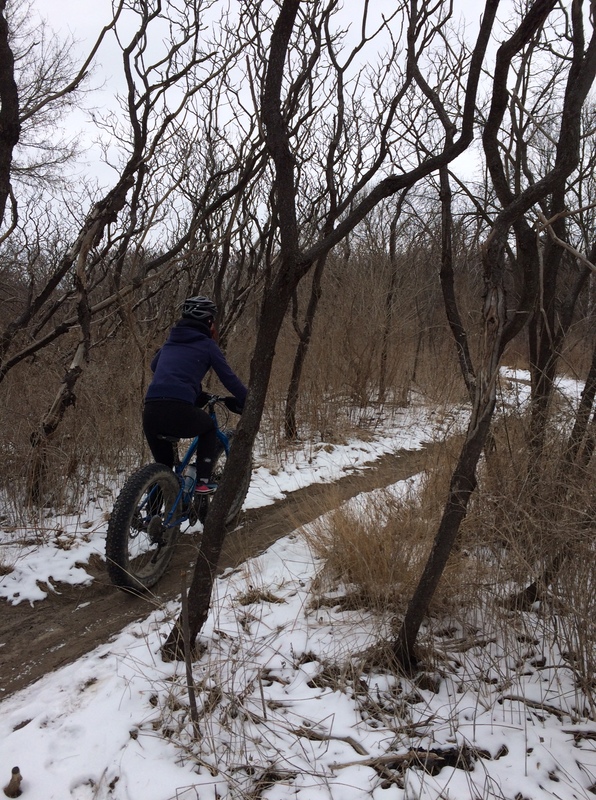 Fat Biking Keeps Me Sane | Kids in T.O. I am always up for some nature in the city. 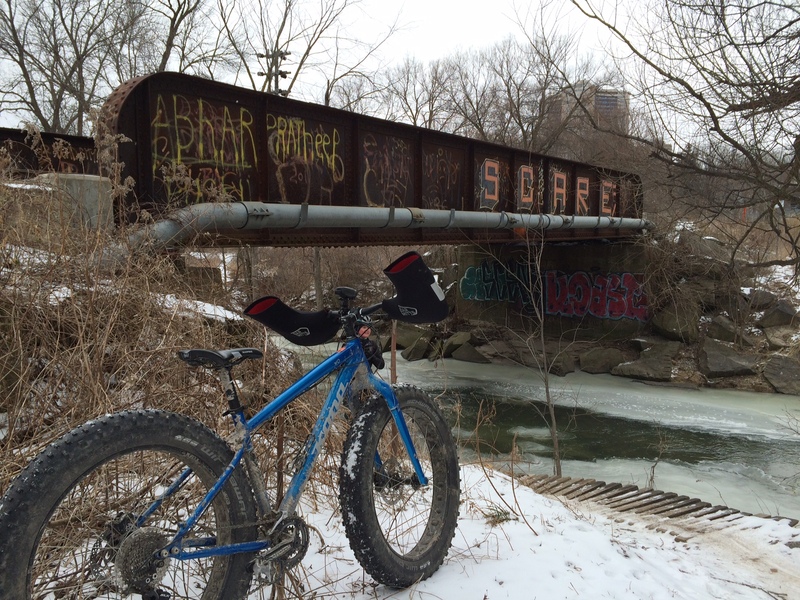 I recently snuck away to explore Toronto’s Don Valley trails in winter – without kids and on two wheels. Two big fat wheels. As a first-time mountain biker, I arrived slightly nervous and probably overdressed at Evergreen Brick Works for their Saturday Fat Bike Group Ride. But the enthusiastic welcome from the biking experts Megz and Kael (from Sweet Pete’s Bike Shop) had me convinced that I was ready for the adventure. After some tips on gear-shifting, braking and how to position yourself on different terrains, we were off (with our guides leading the way) for 1.5-hour ride north in the surrounding ravines. The well-marked trails and over-sized tires made it easy to travel over pretty much anything and enjoy the new views of the valley. There were just enough curves, hills and bridges that had my heart-rate (and adrenaline) pumping. And just when I thought I had tested out all my new-found skills, a pump track appeared. A what? Here, nestled in the woods along the Lower Don Trail next to what looked like a skating surface was a circuit of little hills, bumps and curves. Mountain biking newbie no more. Getting there: Accessible by TTC with a free shuttle bus from Broadview Station. Driving, there are two large paid (and paperless) parking lots. $1.50 for 1/2hr; $6 max on weekdays; $8 max on weekends and holidays. Free parking after 6 p.m. The group rides start at Sweet Pete’s bike rental container in the CRH Gallery at Evergreen Brick Works. Low-down: The two-hour expert-led group ride is $20, including bike and helmet rentals. You can also bring your own bike and helmet and join in. (Full-day rental for $75.) Group rides are weather dependant. Call or email ahead of time to RSVP your spot or organize a private ride with Alex Legum. 416.825.0358 /alegum@evergreen.ca. Skill level: The ride is for all levels – just need to be 5-ft) and have decent bike handling skills. You don’t have to be the fittest cyclist either but there are definitely some hills and paths that require some athletic power. What to bring: Dress in layers and tuck in laces. Light mitts are fine as the bikes have these awesome built-in neoprene mittens. Bring a water bottle – there are holders on the bikes. Schedule: Saturdays until March 19. Special daily weekday rides during March Break (March 14 – 18).